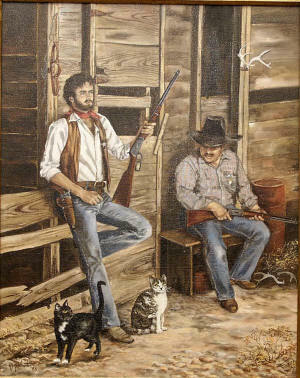 This page shows some of my favorite Western Artwork by Rita McWhorter. Enjoy! 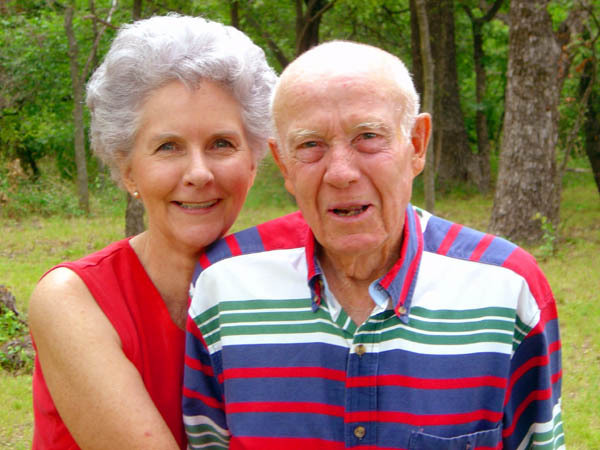 Anyone who has visited the Texas Hill Country in Springtime will never forget the sites and smells as the earth comes alive with blue bonnets and wild flowers. Those that have had the privilege of this experience can bring back those wonderful memories with this stunning painting. In Culberson County, Texas, Ranchers still do things the same way they were done 100 years ago. 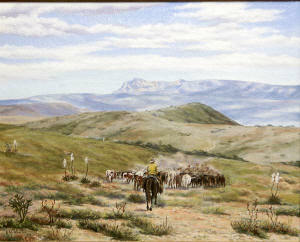 This fabulous piece of fine western art shows a recent cattle drive in Culberson County Texas. Guadalupe Peak, the highest point in Texas can be seen in the background. 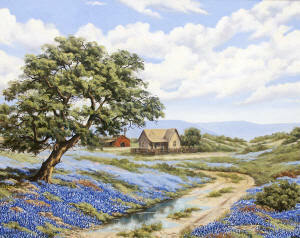 Another stunning landscape of the Texas Hill Country in Spring. 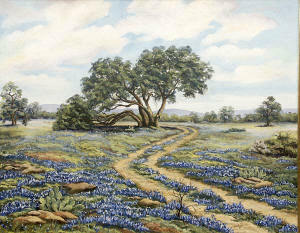 This painting is of a famous tree in Schleicher County, Texas. There are still real cowboys in West Texas. Men who ride horses, rope and brand. 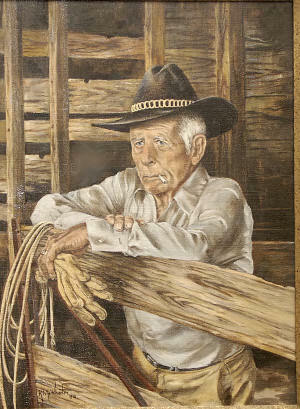 This is a portrait of a West Texas Cowboy taking a break at the end of a long day. 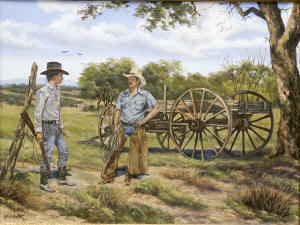 A scene showing two hands on a ranch in Hulldale, Schleicher County, Texas. The beautiful scenery is familiar to all who have visited this blessed part of the country. This is a stunning panoramic landscape from the Delaware Mountains in Culberson County in West Texas. Guadalupe Peak is seen in the background. 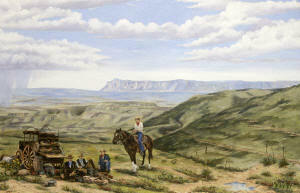 The foreground features working cowboys resting in camp at the end of the day. Site Copyright 2003-2018 Son of the South.